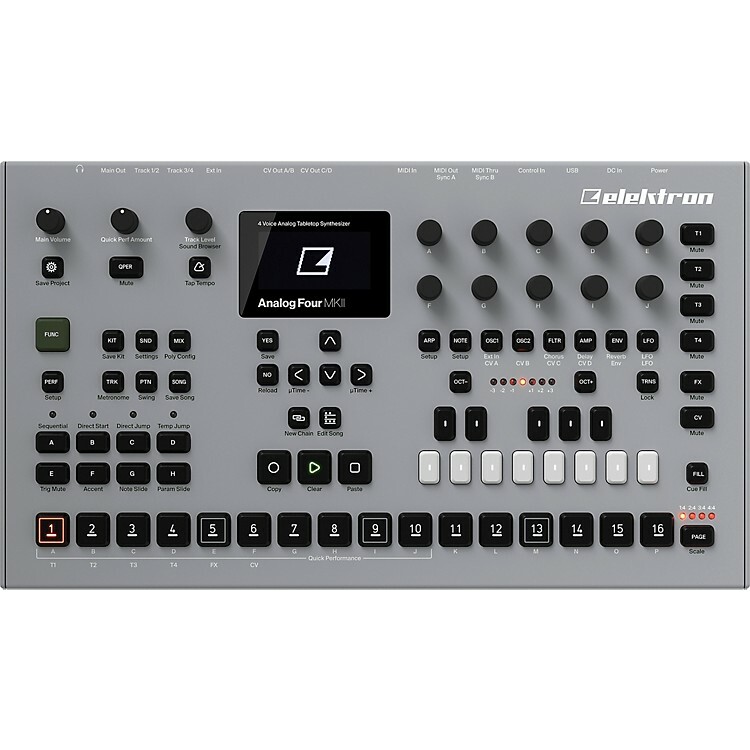 The sequel to Elektron's powerful 4-voice analog/digital hybrid tabletop synthesizer. With a digital mind and an analog soul, the Analog Four MKII represents the best of two worlds. This 4-voice hybrid tabletop synthesizer is packed with enhanced features including re-worked analog circuitry, improved analog overdrive, a large OLED display, durable backlit buttons, hi-res encoders, and so much more. Perfect for studio and stage, the Analog Four MKII delivers a sound that's warm, organic, chaotic, exact, and everything in between. Moulding your own unique analog sounds is simple. Program them with precision, or feel free to design as you go. The sonic range is so vast entire tracks can be created from scratch. Four synth tracks and an intuitive step sequencer enable you to easily create and layer melodies. Then play back your composition and immediately reshape it. Change notes, alter sounds, add effects. Something beautifully unique will emerge every single time. Not only a splendid synthesizer, the Analog Four MKII can also make other gear sing. Thanks to the CV/Gate and DIN sync outputs, external analog gear can be controlled in great detail. Make any modular or vintage synthesizer rig come truly alive. Analog Four MKII's tweaked circuitry delivers deeper bass than ever, new powerful sound control possibilities, dedicated outputs for each voice. Not to mention the ultra durable buttons, the big OLED screen and the premium design. No stone has been left unturned. The best of both worlds, get the Analog Four MKII today! Output:	6 x 1/4 in.